Recently office of the Special Judge , CBI Assam has issued a recruitment notification for filling up various positions. According to the Special Judge CBI Assam Recruitment 2017 Applications are invited from the eligible employees of the establishments of District and Session Judge, Assam for filling up the vacant posts of Sheristadar and Head Assistant in the O/o The Special Judge, CBI, Assam, Additional Court No. 3, Chandmari, Guwahati-781003. 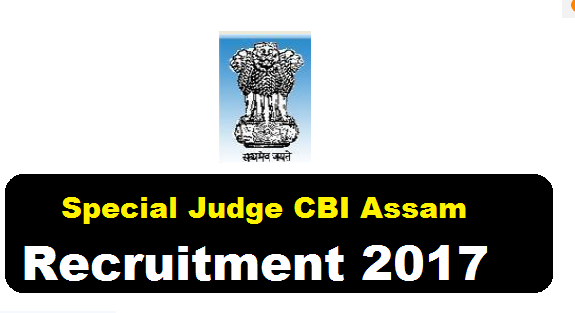 Following are the details of all posts under Special Judge CBI Assam Recruitment 2017 with posts details, number of vacancies, age limit, salary, required qualification with application fee details. Eligibility Criteria : The applicants must possess requisite qualification as per the Assam District and Sessions Judges Establishment (Ministerial) Service Rules, 1987. Interested and eligible candidates may apply with standard form of application. Application is to be submitted through proper channel in the Standard Form with one recent coloured photograph affixed therein along with the copy of their Service Book, Character roll, educational qualifications and 2 photographs. For separate post, separate application in sealed envelope and post applied for should be mentioned on the top front of the envelope. Applicant should provide their email id, if available, and their mobile number in their application. Last datefor receipt of application is 30/11/2017 during office hours. 2/Call letter will not be sent to the applicant by post and the eligible applicant shall have to collect the same from the office of the undersigned as per the information provided in www.kamrupjudiciary.gov.in . 3/Last date and time for receipt of application is 30.11.2017 during office hours.